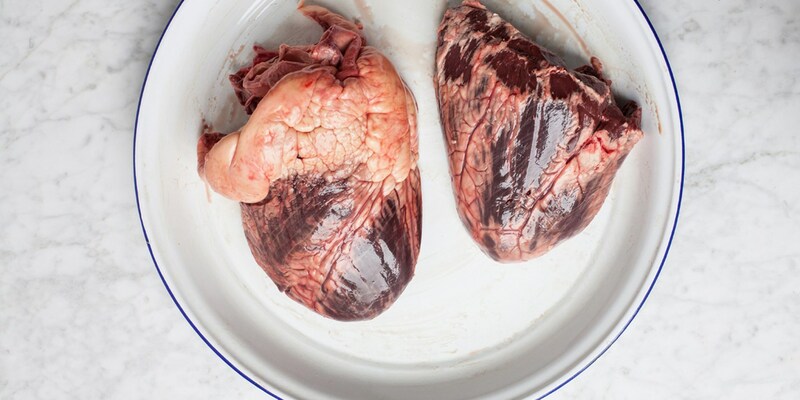 While eating hearts might make you think of Indiana Jones and the Temple of Doom and leave you with the irresistible urge to shout ‘KALI-MA!’, don’t write off the culinary charms of this somewhat visceral cut of meat. As a working muscle, hearts are very lean with a layer of protective fat, which gives them a great texture and a mild gamey flavour. Duck and chicken hearts are ideal for skewers, as Victoria Glass’ Anticuchos proves, while Nuno Mendes serves them as an interesting starter in hisDuck hearts with mushroom floss and spiced broth. Food Urchin takes on Braised stuffed lamb hearts, while Pascal Aussignac shares his recipe for Barigoule of pork heart stew. However, it’s ox heart that really gets proper gourmands excited; for a single serving try Helen Graves’ Barbecued ox heart sandwich, or if you’re cooking for a crowd Regula Ysewijn’s incredible looking Ox heart stuffed with mushroom duxelle makes for an incredible centrepiece.